When a material is versatile enough to be used in a multitude of applications, understanding its characteristics is vital to ensuring it isn’t mistakenly applied to a job it’s not suited for. Given the types of foam products that exist and the different ways each can be used, knowing the hardness of a material is one of the first steps to identifying the best uses for a product. The way hardness is measured for foam and foam rubber products is by a Shore Durometer; a mechanical testing device that assigns a standardized value to the tested material. Named after Albert F. Shore who created the device in the 1920s, a durometer is a precision instrument that calculates a material’s hardness, often called Shore hardness, based on its indentation strength. This system is different than the Mohs scale scratch test, which simply compares one material to another. A Shore Durometer measures against a standardized scale, which allows for more accurate product evaluations to be made. Durometers can vary in shape and size, but are most often hand-held mechanisms. Typically, their most prominent feature is a dial that displays readings, often atop a cylinder that extends downward. Protruding from the cylinder is a 2.54 millimeter (.100 inch) spring-loaded pin with either a spherical or blunted cone-shaped point that is pressed into the material to be tested. The durometer is pushed into a material with the resistance against the pin dictating the hardness. Depending on the material, the pin will be forced back into the shaft by harder materials or indent the material on softer surfaces. There are multiple scales that evaluate hardness because of the number of materials that can be measured with a durometer. These range from hard plastics to rubbers and foam. The three most utilized scales are “A,” which covers the broadest range of materials but not softest or hardest, “D,” which is used for hard materials like plastics and “OO,” for the softest materials like foams and rubbers. On every scale materials are valued numerically 0 to 100, with 100 being the hardest and 0 being the softest. All The Foam Factory products that receive a hardness rating are ranked on the OO scale, as foam is one of the softer materials that can be tested with this process. The ratings placed on the OO scale go from 0 to 100, as with all the others. But while the three aforementioned scales overlap in general terms, a value cannot be translated to one scale if a material was tested on another. For instance, if you have the durometer value of a material on the A scale but want to know precisely how it compares to materials on the OO scale, it must also be tested on the OO scale. There are no formulas that can perfectly equate one scale to another. Different durometers are also used for every scale, as opposed to universal or adjustable ones, because of the variances in pin types and the precision of the spring pressure. The applicable traits that can be most directly gathered from the results of a hardness test are pressure resistance and material flexibility. However, with foam and other soft products, it must be understood that a material’s thickness and the weight it supports are related to its pressure resistance. For example, a high value material will be harder and better at resisting pressure than a lower value if both are used in similar ways, but results may be different when using a low value material ten times the thickness of a higher value material in the same application. For this reason, a durometer value should be used as a framework for expectations, with an understanding that externalities and variables impact performance. The four products The Foam Factory has with a Shore Durometer hardness rating are neoprene, high quality neoprene, and 2 and 4 pound polyethylene foam roll, all ranked on the OO scale. The two neoprene foam types both received approximate durometer hardness values of 50, placing them in the middle range of the OO scale but still ranking on the soft end of the full hardness spectrum. Flexible while maintaining structural rigidity, neoprene is excellent in athletic equipment like gloves, waders, wetsuits and knee and elbow pads. In an industrial capacity, its flexibility makes it valuable as insulation, expansion joint filler in masonry and filler support sealant in traffic bearing joints. 2 pound polyethylene roll received a 51 rating, making it very similar to neoprene in terms of hardness, flexibility and pressure resistance. The 4 pound polyethylene roll received a value of 64, placing it around the medium range for uses that require a sturdy product that will still cushion. 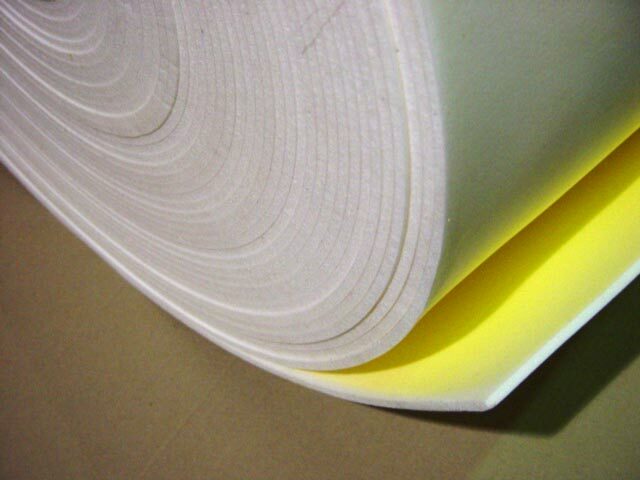 These traits allow polyethylene roll to be used in many ways, including as thermal insulation, pressure sensitive mounting tape, acoustic backing, package inserts and grounding. It’s also used in specialty products such as table pads, running shoes, prosthetic devices and even EKG pads. When assessing materials for a project, it’s important to understand all of a material’s traits to make sure it’s right for the job. When dealing with products like foam that have many different types, as well as different varieties of each type, fully understanding a material’s characteristics is even more important. Understanding the hardness value of a material and what it indicates is one incredibly useful tool for making your most informed purchase decision.